DTSC2430S 29 3/4" x 34 7/8" x 69" stainless steel dolly truck, full-size security unit. 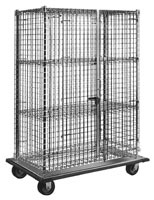 DTSC2436S 29 3/4" x 40 7/8" x 69" stainless steel dolly truck, full-size security unit. DTSC2448S 29 3/4" x 52 7/8" x 69" stainless steel dolly truck, full-size security unit. DTSC2460S 29 3/4" x 64 7/8" x 69" stainless steel dolly truck, full-size security unit.